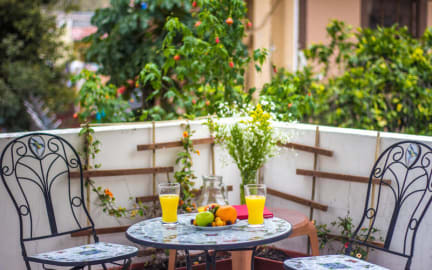 El Patio Hostel has beautiful shared rooms with solid wood beds (King Single 105x190cm), new mattresses, best-quality cotton linens, free towels and big storage lockers. The hostel offers free high-speed wifi, tidy bathrooms with hot water, fully equipped kitchen, offering our guests a great value.This beautifully remodeled colonial house features numerous common areas for socializing, entertaining or simply relaxing. The garden, terrace and shaded courtyard are well maintained with local flora and fauna. Local artists have decorated the walls with graffiti es and urban art. El Patio Hostel is located two blocks from the heart of La Mariscal, Quito’s most entertainment and tourist diversity area. 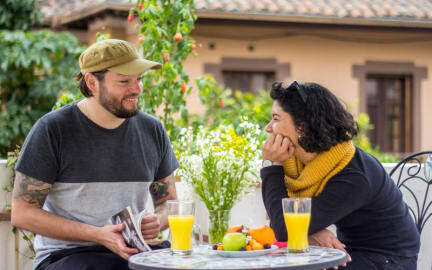 Located on Luis Cordero street and Reina Victoria; el Patio is about 5 mins walk from Plaza Foch and 15 mins walk from the Old City, Artesan Markets and plenty of bars and restaurants to suit any budget. We want to create a traveler community in Quito related to conscious, sustainable tourism and fair trade, which promotes the values of peace, respect and collaboration as the essence of tourism practice. In the shared rooms, there are two bunk beds, that accommodate up to 4 people with a shared bathroom, sheets, towels and WiFi. Ideal for solo travelers or groups, the room is bright and has spacious lockers so you can store your travel bags. Each bed has a blind in case you want privacy, a shelf to place your personal things, a lamp and electrical sockets. Staying here is like staying in your ecuadorian friend's house. Reception from 07:30 to 23:00. The staff was super helpful and the beds were both nice and private. Overall, we really enjoyed our stay. Wow! El Patio Hostel by far exceeded my expectations. The staff were extremely helpful when we inquired about activities. The bedrooms, kitchen and sitting rooms - fabulous! . Nice atmosphere among other guests as well. Outdoor areas to sit and enjoy the weather was a nice treat. Close to a very lively square for restaurant options. Breakfast included was perfect. Definitely recommend staying here! El Patio is in a fantastic location in New Town in Quito. It's about a 5 minute walk from Plaza Foch, which means you can get around easily to things like the Hop On/Hop Off bus, tourist sights, etc but it's also on a side street so you are away from the noise at night. Right by a lot of places to eat too and within walking distance of La Carolina. The breakfast was good and the rooms are clean. 100% recommend. This hostel was great! Know what you sign up for when you go to a foreign country though- some things will be difficult to figure out and the showers are not that warm. The breakfast is amazing, the staff are so kind and helpful (and speak English), and the space is beautiful. I traveled with another female friend (we are both 24) and felt safe the entire time. We enjoyed the advice they gave us for adventuring through La Mariscal. We spent our last night there relaxing on the terrace! Had a great stay at El Patio Hostel, they were super helpful with anything I needed and it's a very comfortable place to stay. It's close to Plaza Foch, but good to not be right in the centre of the noise! I enjoyed my stay here and the staff were very friendly and helpful. The volunteers were also really nice people. The beds in the dorms had a curtain to give added privacy. Breakfast was decent. Location is good, close to lots of restaurants etc but far enough away from noise to get a decent night's sleep. My only minor criticism was with problems with a lack of hot water. Maybe I was just unlucky and the problems have been resolved. Anyway, I would recommend the place for sure. I only stayed one night on my way through Quito but is was great. The dorm room was spacious, large lockers, comfy beds and the curtain adds privacy. The bathroom area was clean and the staff were super friendly. Breakfast was a little underwhelming and there were no eggs when they had been advertised. The hostel is in a good area of town to get to other places. A great choice if you want to be outside the old town and want some peace and quiet. Not lively, but clean secure and really nice. Nice common areas, but few people. Closest to Floresta, but really you want to be in the old city, not here- dangerous at night.